On the Giza Plateau and below the stone-hewn causeway of Khafre’s pyramid complex lies an unusual tomb structure. It’s known today as the Tomb of Osiris or, more commonly, the Osiris Shaft. The latter was so-named by Zahi Hawass, former Minister of Antiquities Affairs. The existence of the shaft tomb has been known for many years, but it was only until relatively recently that it was properly excavated and reported. A thorough excavation was conducted by a team led by Hawass in 1999. Subsequently Hawass wrote an article called “The Discovery of the Osiris Shaft at Giza” for inclusion in a collection of essays in the publication The Archaeology and Art of Ancient Egypt: Essays in Honor of David B. O’Connor (2007). Although Hawass certainly didn’t “discover” this subterranean shaft complex, his team was the first to excavate it all the way to the bottom. His essay in the 2007 publication is a summary of the excavation report generated from the findings. Hawass’s publication of the Osiris Shaft generated widespread interest among archaeologists, Egyptologists, and laypeople alike. To Egyptologists and other professional researchers the Osiris Shaft provided further insight into the general usage of the Giza necropolis down through pharaonic history, and served as an interesting example of the reuse of a putative Old Kingdom cenotaph in the Saite Period (Dynasty 26), when Giza experienced a resurgence of attention and devotion among ancient Egyptians. To laypeople the Osiris Shaft seemed very enigmatic and unusual, even if such might not be true. And to New Agers, Rosecrutians, and other fringe sects the Osiris Shaft was fuel for vivid imagination and wild speculation, from which has been generated all sorts of mistaken, misleading, and implausible information. You will see web pages, for example, which show mysterious tunnels branching off the Osiris Shaft this way and that, implying secret passages to the Dynasty 4 pyramids at Giza. There are intimations of initiation rites and mystery schools and other phenomena not truly of relevance to pharaonic Egypt. I’ve come across such notions many times myself. Probably you have, too. I’d like to summarize the known facts about the Osiris Shaft and hope to present a realistic understanding of what this shaft complex below Khafre’s causeway actually is. I will draw mostly from Hawass’s essay mentioned above. The schematic diagrams I will be using are drawn from Hawass’s essay; other diagrams and photos come from various other Web resources. 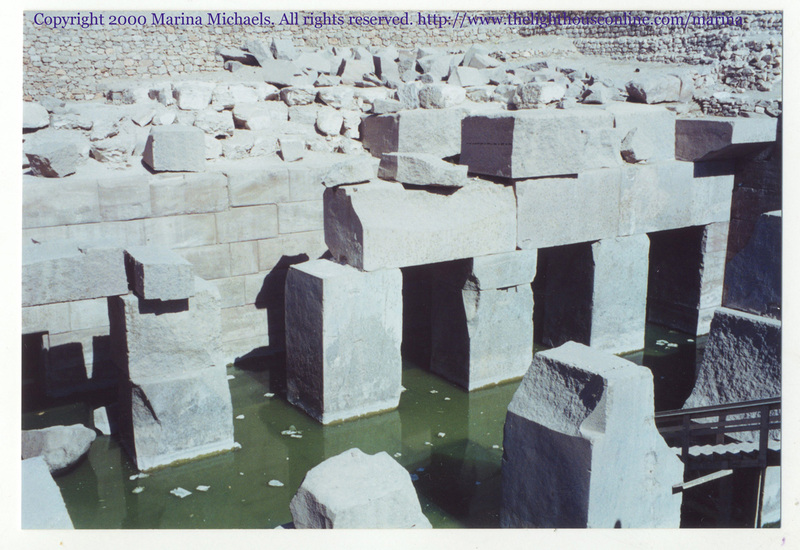 Upon the surface of the causeway they first built a platform in the shape of a mastaba, using stones taken from the ruins of the covered corridor of the causeway. In the centre of this superstructure they sank a shaft, which passed through the roof and floor of the subway running under the causeway to a depth of about 9.00 m. At the bottom of this shaft is a rectangular chamber, in the floor of the eastern side of which is another shaft. This descends about 14.00 m. and terminates in a spacious hall surrounded by seven burial-chambers, in each of which is a sarcophagus. Two of these sarcophagi, which are of basalt and are monolithic, are so enormous that at first we wondered if they contained the bodies of sacred bulls. In the eastern side of this hall is yet another shaft, about 10.00 m. deep, but unfortunately it is flooded. Through the clear water we can see that it ends in a colonnaded hall, also having side-chambers containing sarcophagi. We tried in vain to pump out the water, but it seems that a spring must have broken through the rock, for continual daily pumping over a period of four years was unable to reduce the water-level. I may add that I had this water analysed and finding it pure utilized it for drinking purposes (Hassan 1944: 193). Hassan and his men, then, were able to get part way down the shaft complex, but found the remainder flooded. Efforts at pumping were unsuccessful. Hassan was not the only person to find the water in the shaft pleasing because for many years hence it was, in fact, a source of drinking water on the Giza Plateau. In other times Giza guides and nearby village children would swim in the shaft, when the rising water table flooded the complex still further. Particularly interesting to me in this old report is the suggestion of some sort of superstructure which Hassan notes was “in the shape of a mastaba.” That the shaft complex should have a ground-level structure of some sort is not the least unusual, for if it indeed had been used for burial, such a feature is to be expected. But in more modern publications, Hawass’s included, the remains of a ground-level structure are not reported. It’s possible the ruins of the superstructure were still in evidence in Hassan’s day but have since disappeared. Take note also of Hassan’s mention of a “subway running under the causeway.” The use of the word “subway” is sometimes mishandled by modern people trying to make sense of the archaeology of the shaft complex, and they take it to reinforce the New Age notion that there are “subways” running this way and that below the surface of the Giza Plateau. 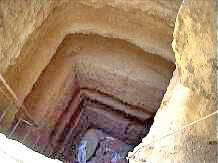 All the term refers to is a small tunnel burrowed under the causeway of Khafre’s pyramid complex. This tunnel probably served as a shortcut for priests and other temple personnel to bypass the causeway; a similar bypass was excavated under the remains of Khufu’s ruined causeway, to the north (Hawass 2007: 395). 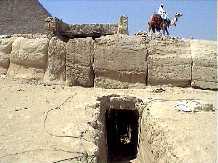 The opening to the Osiris Shaft lies near the western wall of the tunnel running under Khafre’s causeway; the tunnel itself is situated south to north under the causeway. The opening to Shaft A can be seen in this photo, in which is visible a modern metal ladder providing access to the first chamber. At its widest the entrance is about 10 feet. The depth of Shaft A is about 32 feet. Shaft A opens into the first chamber, Level 1. 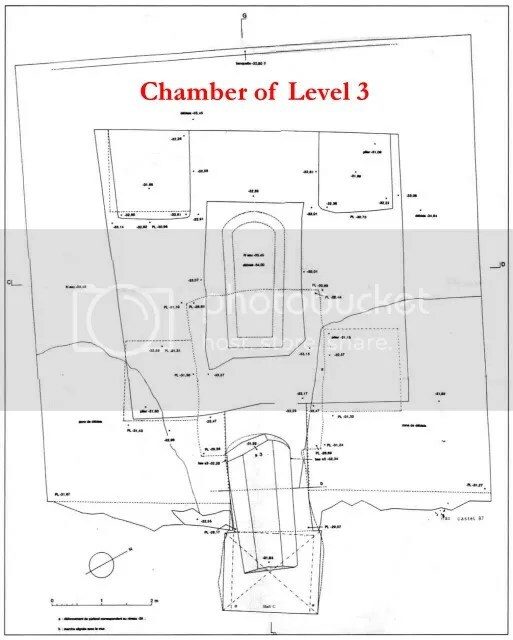 It’s a roughly rectangular chamber 9 feet at its highest point and 13 feet at its widest point. The chamber runs to about a length of 28 feet. As with all three chambers it is roughly cut. No artifacts were found in Level 1. A number of artifacts were excavated from these side chambers, including pottery sherds, ceramic beads, and ushabtis (small servant figurines). Additionally, basalt sarcophagi were found in Chambers C, D, and G; badly decomposed skeletal remains were found in the sarcophagi in Chambers C and G. Based on stylistic grounds the artifacts, sarcophagi included, date to Dynasty 26 (ibid: 386-87). In a large niche in the southeast corner of Level 2, Shaft C sinks down to the lowest chamber in the Osiris Shaft complex. Shaft C is about 6 feet at its widest point and descends to a depth of 25 feet. There are seven little niches carved into the walls around the opening to Shaft C, in Level 2. It is believed these little niches were used as anchor points for wooden braces used to lower a sarcophagus down Shaft C to the lowest chamber (ibid: 388). 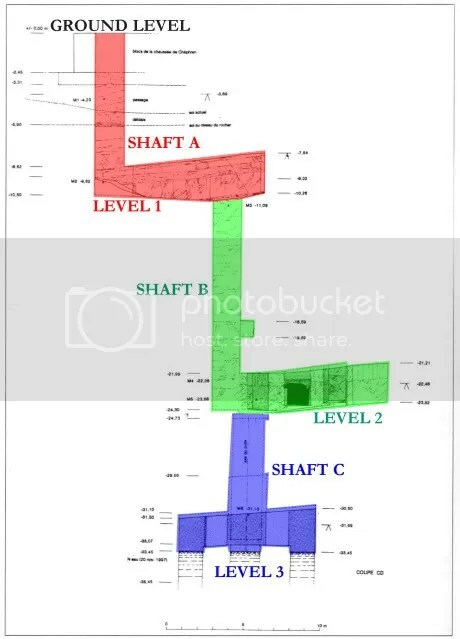 Shaft C opens into Level 3, the lowest space in the Osiris Shaft. This chamber is more complex architecturally, although still rough-cut. The length of the eastern wall is about 29 feet, the western wall about 30 feet, the northern wall about 31 feet, and the southern wall about 28 feet. 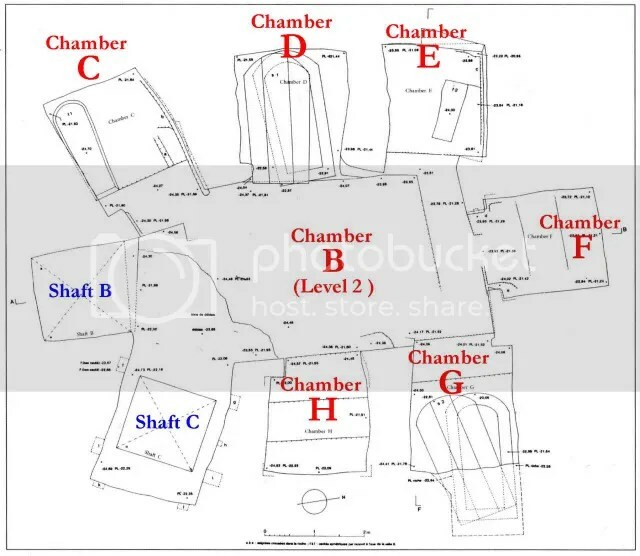 Therefore, the chamber in Level 3 is more or less squarish in nature. There is a narrow ledge carved into the living rock around the edges of the chamber, and at center a large rectangular emplacement also carved from the rock. This provides a trench running around the stone emplacement, and during excavation operations this trench remained water-filled. At the corners of the trench were the remains of four square pillars, roughly cut and now almost completely destroyed. 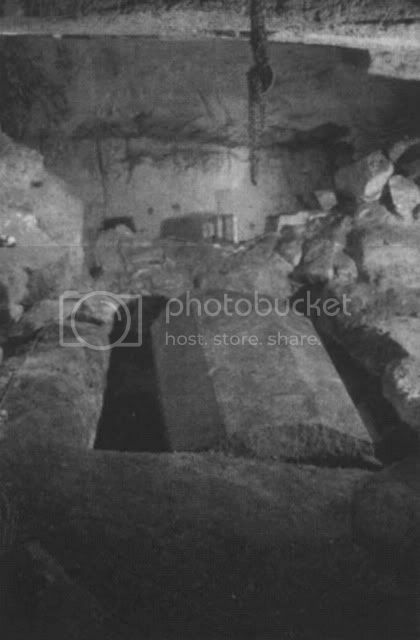 A shallow pit had been excavated from the center of the emplacement, and in the pit was found a pseudo-anthropoid sarcophagus carved from basalt. The lid had been found in the floor of Shaft C and Hawass’s team hoisted it back on top of the coffer. Skeletal remains were found inside the sarcophagus which, together with amulets and other artifacts found within Level 3, date to Dynasty 26 (see photo here and plan below, from Hawass 2007). An important find in Level 3 was red-polished pottery with traces of white paint, which stylistically can be dated to Dynasty 6, from the end of the Old Kingdom. Therefore, this pottery represents the oldest possible datable material in the entire complex. The web page includes this photo of the young boy exploring the tunnel. Whatever reason the original workmen had for excavating this tunnel, they abruptly ceased their work on it after about 16.5 feet. It would appear to follow the course of a natural fissure, but robotic exploration and endoscopic cameras were unable to learn anything substantial about the course the natural fissure took. This failed side tunnel, then, represents the only “passage” within the entire complex of the Osiris Shaft, which represents an otherwise sealed and self-contained environment. Contrary to New Age and fringe notions, there are no vast networks of secret passageways intersecting with the Osiris Shaft. From the archaeological evidence the Osiris Shaft seems to date originally from the Old Kingdom and specifically to Dynasty 6 (2355-2195 BCE). As was established during the excavation certain parts of the complex were expanded and/or repurposed for intrusive burials in the Late Period, specifically in Dynasty 26 (Saite Period, 664-525 BCE). Intrusive burial was an extremely common phenomenon throughout the 3,100 years of pharaonic Egypt, and tombs of any sort from earlier ages were basically ready-made for the purpose. Intrusive burials were especially common in the countless tombs of the sprawling Memphite necropolis during the Late Period and subsequent periods. The Osiris Shaft might date to as early as Dynasty 6 but there is no certain evidence for a burial from Dynasty 6. As stated, the sarcophagus found in Level 3, the original and deepest part of the complex, dates to the Late Period. Hawass argues that the Osiris Shaft was a cenotaph for the god Osiris (ibid: 390). I agree with the possibility of this but not necessarily with all of the conclusions Hawass reaches in his essay to support the argument. There is indeed a well-known cenotaph for Osiris in Abydos: the Osireion in the large temple complex of Seti I. Like the Osiris Shaft at Giza, the Osireion at Abydos was a subterranean ritual tomb for Osiris, and the Osireion seems to have been deliberately built so that its lowest area would be constantly flooded. I question whether the groundwater in the Osiris Shaft was, however, a deliberate design feature of this complex at Giza. It certainly might have been but, in my opinion, it’s not definitively understood. The water table at Giza has fluctuated significantly down through time, and for all we know the men who originally cut the Osiris Shaft encountered no water seepage during their work. Also, it seems to me Hawass draws on perhaps too much later material to form his conclusions about the nature of the Osiris Shaft. The Osireion at Abydos, for example, was built in Dynasty 19, around 1,000 years after the earliest possible period for the Giza tomb. Now, Osiris as a god does not seem to have been prominent until later in the Old Kingdom, and the earliest evidence for any cult for him is during the reign of Djedkare-Isesi in Dynasty 5 (Wilkinson 2003: 120-21). This means a date of Dynasty 6 will work for Hawass’s argument, so that much is in his favor. Hawass also notes that the Giza Plateau was known as “House of Osiris, Lord of Rosetau” (pr Wsir nb rA-sTAw) in the New Kingdom (Hawass 2007: 391). This is, however, the New Kingdom, not the Old Kingdom, so the Egyptian word “Rosetau” (rA-sTAw) needs further attention. It’s typically translated as “entrance to underground regions” (Zivie-Coche 2002: 75) or in similar ways. The literal translation for Rosetau is “passage of dragging,” a reference to the sloping entranceway to tombs; eventually the word was extended to mean “cemetry” in general and the Memphite necropolis specifically, later also being applied to Abydos (Lesko 1991: 119-20). Christiane Zivie-Coche argues that Rosetau went on to refer to a specific place at Giza south of the Great Sphinx (2002: 75). Hawass notes that the water-filled trench in Level 3 bears a resemblance to the hieroglyphic biliteral for pr, “house.” This is perhaps an overemphasis on Hawass’s part for seeing the original construct of the shaft complex as “House of Osiris, Lord of Rosetau.” I personally am not convinced that the tench in Level 3 was designed for that purpose. It seems to me to be a bit of a stretch. The shaft complex itself is uninscribed. The first god to be associated with Rosetau was not Osiris but Sokar. Originally Osiris appears to have risen as a deity in the southern regions and especially at Abydos, whereas Sokar, a hawk-headed deity, was the original afterlife god of the Memphite region (Wilkinson 2003: 209-10). This means that in the time of Khufu, Khafre, and Menkaure, in all likelihood Sokar held more prominence at Giza than did Osiris. The sum total of archaeological evidence from Dynasty 4 at Giza would seem to bear this out, given the absence of Osiris until the end of Dynasty 5. The Osiris Shaft as a cenotaph for Osiris remains plausible for Dynasty 6, but equally plausible is as a cenotaph for Sokar. Then again, also plausible is that Level 3 was indeed used for the burial of someone from late in the Old Kingdom, even if no archaeological evidence remains to clarify the possibility. I might disagree with some of Hawass’s conclusions about the nature and purpose of the Osiris Shaft, but I applaud him and his team in 1999 for their thorough excavation of the complex under unpleasant and dangerous conditions. They at last brought this little-understood feature into the light of day. We can outright dismiss misguided notions that the Osiris Shaft is part of some vast network of secret passageways, and we can equally dismiss arguments that the Osiris Shaft had anything to do with the three Giza pyramids. There is simply nothing archaeological to substantiate such an idea. We can continue to debate what exactly the shaft complex was originally intended for, but at the same time we needn’t expend effort or time in arguing things it was clearly not intended for. Zahi Hawass’s essay can be downloaded from this link: The Discovery of the Osiris Shaft at Giza. Faulkner, Raymond O. A Concise Dictionary of Middle Egyptian. 1962. Hassan, Selim. Excavations at Giza, Vol. V: 1933-1934. 1944. Hawass, Zahi. “The Discovery of the Osiris Shaft at Giza,” The Archaeology and Art of Ancient Egypt: Essays in Honor of David B. O’Connor. 2007. Lesko, Leonard H. “Ancient Egyptian Cosmogonies and Cosmology,” Religion in Ancient Egypt. Ed. Byron E. Shafer. 1991. Porter, Bertha and Rosalind L. B. Moss. Topographical Bibliography of Ancient Egyptian Hieroglyphic Texts, Reliefs, and Paintings: III. Memphis. 1974. Wilkinson, Richard. Complete Gods and Goddesses of Ancient Egypt. 2003. Zivie-Coche, Christiane. Sphinx: History of a Monument. 2002.